Han Solo and his first mate, Chewbacca, have really done it this time! After making the Kessel Run in the Millennium Falcon in just under twelve parsecs, an Imperial spy on the Garrison Moon alerts the Empire to their presence. Han and Chewie are determined not to give up without a fight. Using a new modification technology, Han morphs the Falcon into mech mode as a Star Destroyer approaches. 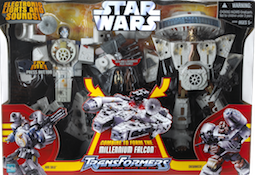 The Falcon suddenly splits into two heavily armed attack robots! The Imperial ship is rocked with a barrage of missile fire. Although she may not look like much of a threat, the Millennium Falcon sure does pack a solid one-two punch of speed and power!